Personalized Pocket Magnifiers. Promotional prices in USA and Canada. Business Card size. Business Card Magnifier, Business Card-size, fits easily in your wallet, purse or pocket. 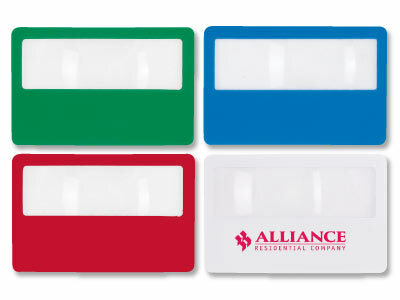 Bulk personalized wallet or pocket card magnifiers (business card size), custom imprinted with your logo or message.